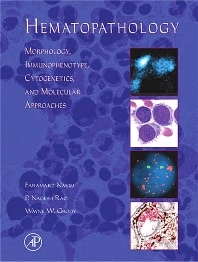 This comprehensive, full color hematopathology reference book emphasizes immunophenotpic features, cytogenetic studies, and diagnostic molecular aspects. Hematopathology begins with introductions to morphologic evaluation of the hematopoietic tissues and principles of immunophenotyping, cytogenetics and molecular studies followed by chapters dedicated to different types of hematologic disorders. Each chapter starts with a basic overview of hematopathlogy followed by a comprehensive review of immunophenotypic, cytogenetic and molecular findings. The text is balanced with large numbers of full color images, graphs, charts, and tables to assist the reader in understanding these highly technical issues. Features hundreds of images, charts and tables for the identification of hematologic disorders not only based on histopathologic features, but also with the use of advanced accessory techniques. Pathologists, pathology fellows and residents, clinical laboratory pathologists, hematopathologists; hematologists/oncologists and hematology/oncology fellows. Dr. Faramarz Naeim is Professor Emeritus of Pathology, David Geffen School of Medicine, UCLA. He graduated from Tehran University School of Medicine and received his training in Pathology at Mallory Institute of Pathology, Boston City Hospital and Department of Pathology at UCLA School of Medicine. He has provided clinical services as a hematopathologist for 43 years, 30 years at UCLA, Department of Pathology and Laboratory Medicine, and 13 years at VA Greater Los Angeles Healthcare System, Department of Pathology and Laboratory Medicine. Dr. Naeim has published several books and book chapters in hematopathology and numerous articles in peer review journals. Dr. Rao is an established Elsevier author. Current projects include analysis of cytogenetic abnormalities in Paget's disease patients and analyzing the mouse karyotypes for identifying XXY males among the offspring of female chimeras from embryonic stem-cells. His cytogenetics laboratory is a training site for interested residents, fellows and medical students. "This is a great book for practicing hematologists and medical oncologists as well as trainees and faculty in anatomic and clinical pathology. The writing is crisp, the figures and tables, all in color, are of high quality and informative and the book contains a wealth of information that is not readily available in reference textbooks of hematology, oncology or pathology. I give the book two thumbs up." "This book provides both the expert and the novice with the essential materials and didactic support needed to select, understand and interpret critically the vast number cell and tissue analyses now available from hematopathology laboratories. This text takes a commendably practical and clinically oriented approach to understanding the biologic basis of these tests, the technical, biological, and clinical pitfalls involved in their interpretation, and their power in aiding classification, prognostication and treatment selection. This is a very valuable teaching aid and reference volume for advanced students, residents in pathology, hematology oncology fellows, and specialists in blood disorders. The book should also be helpful to basic scientist working in these fields." "Hematopathology is a well written and comprehensive text that provides both strong background and specific details regarding hematological malignancies and their diagnosis. The text is easy to read and well organized. There are numerous high quality photomicrographs and comprehensive tables (particularly the cell differentiation molecules table) that complement the text. I particularly liked the background information regarding hematopoietic stem cells, and the practical aspects of the sections describing the principles of flow cytometry, and the techniques employed in karyotyping. This is something you don’t often find in many texts."